What happens if doran the siege tower is killed before declaring blockers? Cast during declare attackers and copy in declare blockers? 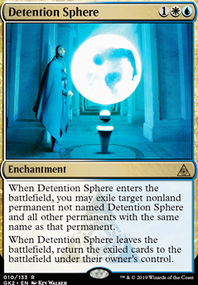 I'm thinking of dropping 1x Remand and putting Immolating Glare back in. Really think you should get 4th Ajani's Pridemate. Also, Immolating Glare could be a combination of Blessed Alliance and Condemn. HoboKinToken I would keep Immolating Glare as having removal is good and Hindering Light I have never liked as it just feels limited and in my playtesting with it feels like it ends up as a dead card in hand more than you would think. 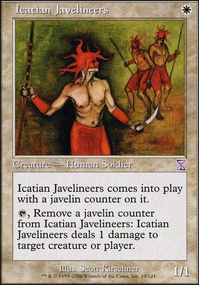 Is Justice Strike any better than Seal Away (or even Immolating Glare/Blessed Alliance) ? 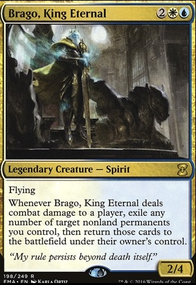 I guess it is better against BGx decks with Abrupt Decay/Assassin's Trophy/Maelstrom Pulse (though as you've mentioned it doesn't hit Goyf/Tasigur) but otherwise I'd probably prefer the enchantment. 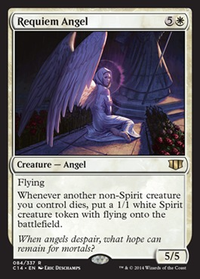 Also, why not play a Gideon, Ally of Zendikar or two over some of the 3-mana ones (4x seems a bit much). Going with Nahiri + Emrakul seems good as well to quicker win games and have maindeck enchantment/artifact removal and rummaging engine. Shalai, Voice of Plenty also seems like a good option as it acts as a Leyline and also protects your PW's from removal. 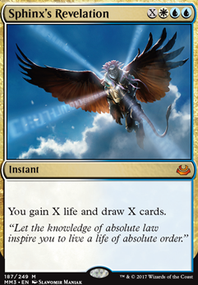 Maybe it can replace some of the Hazoret/Leyline cards. In the SB why no Damping Sphere ? Against Control I'd probably want some Ricochet Trap in the SB as well. Brimaz, King of Oreskos can be this deck's version of Goblin Rabblemaster to board in threats and it conviently survives Deafening Clarion. Hero of Bladehold is another option for a post-board creature plan. Kinge I was also thinking of replacing Immolating Glare with Hindering Light. Immolating Glare is easier to cast, but Hindering Light has the card draw. Urza's Ruinous Blast seems like a good fit for the deck since many of your non-land permanents are legendary. You can't cast it without a legendary creature or planeswalker, which can be a pain, but that shouldn't be too much of a hurdle for this deck. You may want Austere Command over Cleansing Nova: it costs an extra mana, but you get a lot more flexibility. Immolating Glare is the same effect as Rebuke at one mana cheaper. 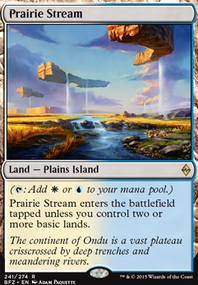 Several of your Legendary creatures (including your commander) are quite expensive, so you might want Land Tax to ensure you have lands to play every turn. Sword of the Animist or artifact ramp like Marble Diamond, Mind Stone, Hedron Archive, or Dreamstone Hedron could also help here. I'm not sure whether you want mass land disruption like Armageddon, Cataclysm, and Winter Orb. They can be effective at converting temporary advantage into a win, but the deck looks like it will play best when you have a lot of mana to cast your spells, and recast your legends if they die with your commander on the field. If you do, focus on effects that destroy or force the sacrifice of lands (Armageddon, Cataclysm, Magus of the Balance, Fall of the Thran, Ravages of War (though that last one is way too expensive because there weren't many printed)) instead of Winter Orb, and use Crucible of Worlds or legendary lands you can get back with your commander to break the symmetry. I'd recommend looking at Flagstones of Trokair, Mikokoro, Center of the Sea, Gods' Eye, Gate to the Reikai, Eiganjo Castle, Geier Reach Sanitarium, and maybe Hall of the Bandit Lord or Legion's Landing Flip. You might also want Dust Bowl in this case. I'm not sure you have enough density of legendary spells for Untaidake, the Cloud Keeper to be good, but it might be worth it. I don't think Darksteel Forge is that useful here: you have useful artifacts, but not that many and you aren't super reliant on them. There don't seem to very many activated abilities for Rings of Brighthearth to copy. You may not need that card here. Elspeth, Knight-Errant, Gideon, Ally of Zendikar, or Elspeth, Sun's Champion all seem better in this deck than any of your planeswalkers except Karn. dino_beast, thanks for your suggestions! Never thought about Immolating Glare this way...you are definitely right, it is kinda conditional. Vraska's Contempt is a very nice card, but its cost (mana and money) bothers me a little. If I can get one of it, definitelly gonna try it out. About Fatal Push, it is a very good card. The only reason I didn't buy it yet is because of its price. But as soon as I can in gonna buy a pair and add to the deck. 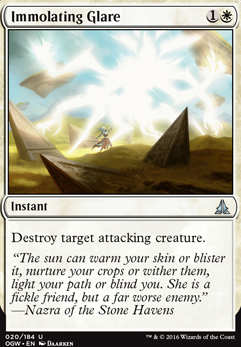 Immolating Glare seems a little too conditional with how little removal you have, and so maybe Vraska's Contempt would be better, as it doesn't require it to be attacking, exiles, can hit walkers and gains 2 life to boot, which I would say is definitely worth the 2 extra mana, or possibly Fatal Push as it is cheaper, doesn't have the limitation on them having to attack, and still hits almost everything being played in modern. Good luck, and +1 from me for the deck so far!